Everytime Daisy wakes up she is happier, stronger and more playful. She smiles and flirts with the nurses and techs and her little face gives us pure joy. 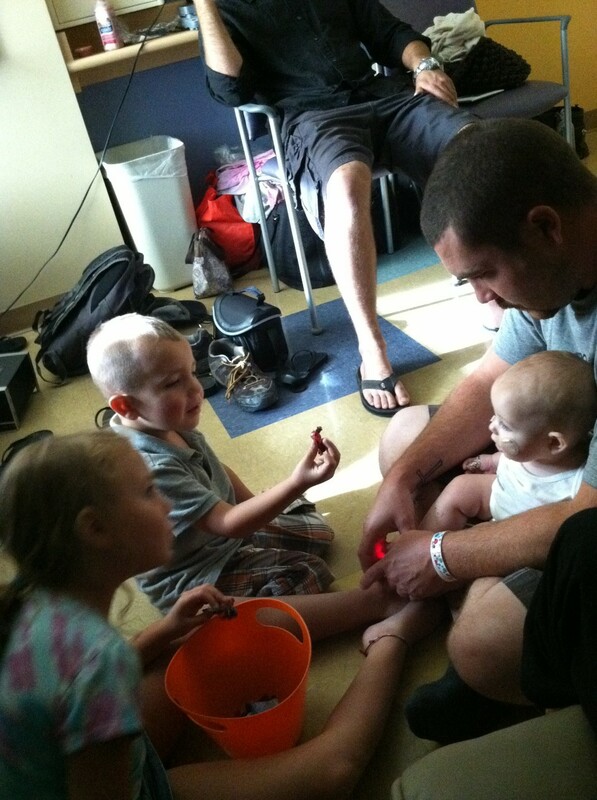 She was even able to sit with her daddy on the floor to play with Aravis and Judah. We're really starting to see Daisy return. We will most likely be able to leave the hospital sometime tomorrow. Assuming everything goes well tonight Daisy will get a chest x ray in the morning and we will be released sometime after that. When Daisy was stung by the scorpion we were nine days away from having insurance. It was in the back of my mind once we settled into the PICU but my girlfriend Megan told me to just be in the moment, to not even think about the bills until it was time to face them. It's starting to weigh on me a bit. I know that going home will be blissfully sweet, but we are facing a giant obstacle. My Holy Yoga Family has already banded together to give such sweet gifts to help us get through this week and my girlfriends have started an online fundraiser to try to help us. We are so very humbled. Money is a subject I always always hate. But we are blessed. We are so aware of how loved we are. Thank you to those of you who have helped to relieve even an inch of our heavy burden. We are filled with appreciation for you. Goodnight Family. We love you.